Monte Di Panza sits in one of the most picturesque corners of Ischia. Just a short walk away from the neighbouring path of La Baia Pelara, it passes over the top of a cliff with some dramatic panoramas. 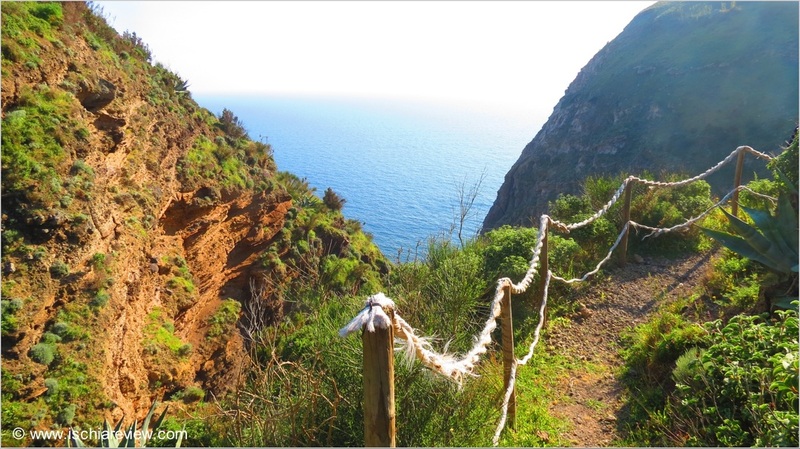 The Monte di Panza walk is a short, yet rewarding hike across a cliff top close to the village of Panza on the west coast of Ischia. The trail leads first from the village, down some winding country lanes and then across the cliff-top with its beautiful panoramic views down to Sant'Angelo and across the sea to the neighbouring islands such as Capri. From the main village square in Panza, follow the signs towards Sorgeto Hot Springs but don't go all the way down. After about ten minutes of walking from Panza Village you will see two signs on your right hand side, pointing towards "Sentiero Baia Pelara" and "Monte di Panza". These are two separate walks but they start from almost the same place. The initial signs will point you towards the same place until eventually you are given the choice of descending to your right for Baia Pelara or continuing straight on for Monte di Panza. At this stage you should continue straight ahead until shortly you are given another sign that points to the left and up a hill. At the top of this hill is the main cliff-top area of the walk. This area is surrounded by wild flowers and has some stunning views down to Sant'Angelo. Continue ahead from this point and you will eventually notice the path begins to narrow and descend as you reach the end of the cliff. There are guard-rails to help you along at this point and the utmost care and attention needs to be taken as there are steep drops on either side of the path. From start to finish the walk to the edge of the cliff is about 15 minutes and you then head back in the same direction from which you came. For a more substantial walk you can then descend the sign to Sentiero Baia Pelara that you passed on the way. This will add another hour to an hour and a half on to your walk before you return to the village of Panza to take the bus back to your hotel or accommodation.